The best dog crates for 2018 are based on a number of factors, including whether you have a growing puppy, an adult dog, your pet’s temperament, and your own personal needs. There are several different types of indoor dog kennel to choose from. We’ll be looking at the best crates of each type, plus answering some questions you may have about buying crate accessories, using and training your pet to use their new home. Should You Use The Crate’s Plastic Pan Floor Or Buy A Dog Crate Bed? Where To Buy Dog Crates? How To Fold A Dog Crate? What to Put In A Dog Crate? Is The Thundershirt Good For Crate Training and Separation Anxiety? Buying a crate is a great aid for dog training, whether you’ve just become the proud owner of a new small puppy, or a large adult dog. They are particularly helpful as an aid to training a pet that is a bit aggressive or out of control, or a pet that simply can’t stop getting up to mischief. Working out what dog cage to buy depends on a number of factors. In addition to crates for home use, designs for travel are also available, whether you are taking your pet for a journey by car to the vet, camping or staying in a hotel, or taking your pet on a plane to fly. The wire frame cages are the most common form of indoor dog crate. Wire dog kennels are highly popular for owners that want a sturdy and secure solution, and particularly suited for crate training puppies or dogs that have already been crate trained. They are typically inexpensive compared to other types of crate that focus on utility or aesthetics. As they are a cage made of thin wire they also provide maximum visibility compared to other types of crate. So it’s easy for you to keep an eye on your pet. And vice versa, your dog can feel relaxed seeing that you are there. You can use dog crate covers for times of privacy or settling your pet down for rest or sleep. The Midwest iCrate Pet Crate and Midwest Life Stages Pet Crate are two of the most buyer recommended top rated dog crates for puppies or small dogs as well as trained adult dogs. It has excellent dog cage reviews. The Life Stages crate has the better construction of the two. As the words in the title Life stages suggests, the crate is intended to be used as your puppy grows into a full adult dog. It may cost slightly more than the iCrate. But we feel the price difference is a negligible, justified and smart investment. The Midwest Life Stages Crate is our pick for top wire dog crate. It is available in two door designs: single door and double door. Having two doors gives the additional benefit and convenience of having both long and short side crate access for your dog to enter and leave the crate, or for you to access the inside of the crate. The crates come with a divider to ensure that you can allocate the right amount of accessible space for a puppy, as he or she grows into their full adult dog size. There are six cage sizes across both lines of Midwest crate. The length sizes are the same in both, but the other dimensions can vary. The lengths available are: 22, 24, 30, 36, 42, 48″ L. A smaller 18″ L version is also available for the iCrate only. The crate is also foldable or collapsible thanks to it’s folding design. This makes it quick and simple to set up the crate, and to take it down again if you need to transport the crate, with or without your pet, or to recover space when not in use. They are great if you need a crate for large dogs that are already trained as well as puppies. For dogs that go crazy and try to bash, smash, or chew their way out of the crate when locked inside, wire cages are not suitable. Instead get a heavy duty dog cage. It’s no coincidence that these Midwest crates are one of the best rated cages in their class. We believe they are fantastic for training a young puppy through to adult. These cages are adjustable to grow the accessible space inside the crate in line with your pet’s growth into adult size, thanks to the cage divider that they come with. These crates are mainly aimed at owners of dogs that are already crate trained who are looking for a crate a little different and decorative. Because the main material is wicker, it can easily be chewed and destroyed, so wouldn’t want to use it for an untrained pet, lest they quickly rip away all the wicker and destroy the crate. Wicker crates may have their frame reinforced with metal wire. Essentially they are a hybrid of wire crate frame with wicker coating / exterior to beautify it. There wasn’t really much variety of this type of crate, which is not surprising as their main appeal is aesthetic rather than utility, and are a beautified or visually enhanced version of a wire crate. If you would like one, the PetSafe Solvit Mr. Herzher’s Indoor Pet Home is a good choice. ATTRACTIVE DESIGN: Dark brown wicker design looks great with most home interiors; the medium measures 30 in. x 21 in. x 24 in. and accommodates dogs up to 50 lb. A plastic dog cage is most commonly seen in use for transporting a pet from one location to another. As such, these portable dog kennels often include a carry handle for that purpose. These portable kennels for dogs may also sometimes be referred to as a hard-sided dog carrier or plastic dog carrier. They make the job of transporting your pet to and from home quick, simple and easy compared to most other crates. Maybe you are looking to get a new pet yourself, you already know about these crates, and are looking to get one to help you bring your new pet home. And wondering what one to buy. Or maybe you are considering getting one for your new pet’s den, as they are also used as indoor dog kennels, albeit mainly for smaller breeds of dog and puppies that will now grow much. For larger puppy breeds, they are typically used in a very temporary capacity, rather than as a dog’s den. This is because a growing pet will soon outgrow the crate. Not only that, but a plastic cage is also not designed for housebreaking a growing puppy. Plastic dog kennels can’t be easily sectioned off like wire crates can, such as the Midwest Life Stages Crate. Their domestic storage footprint is light, as commonly the top and bottom halves are separable. So when not in use you can store one half of the crate inside the other. The Petmate Two Door Top Load Pet Kennel is our pick of the best plastic dog kennel for all round general use. Its front and side doors allow for easy and convenient access to the crate for you and your pet. Plastic crates are not just convenient for providing the portability for traveling with your pet by foot or on the road. Some of them are also airline approved dog crates that enable you to travel with your pet by air. One very popular choice is the Petmate Sky Kennel. However, note that there are two types of airline approved kennel. The difference between the two is that one is designed to be extra secure and strong to cover dog breeds categorized as powerful or potentially aggressive. The International Air Transport Association (IATA) has established the common requirements across airlines for pet travel by air. It has also established the more stringent CR82 rules must be followed in the case of powerful dog breeds. For the latter a stronger IATA 82 dog crate is required. Do note however, that while you can find many plastic crates that are airline approved, this simply means that it meets an agreed set of standards set by the IATA. It does not mean that the crate is okay for travel on all airlines, or that the airline you’re considering flying with allows pet travel. The crate may also require the purchase of accessories to make it compliant for flying your pet. More info on that is below. The Petmate Sky Kennel is our pick of the best crate for air travel with a dog that doesn’t fall under stricter dangerous dogs IATA CR82 requirements. As the name suggests, the Petmate Sky Kennel was specifically designed to be an airline crate for pet travel. You will need to check the pet travel requirements of the airline that you are considering flying with. This is because some airlines do impose their own additional conditions or requirements on top of the standard requirements for IATA airline approved crates. One of those extra requirements might be that the crate does not have a top door, typical of some plastic crates. So do additionally always check the requirements of the airline(s) you’re considering flying with. The Petmate Sky Kennel does not have a top door. Like its name suggests, the Petmate Sky Kennel is designed to meet air travel requirements. The Petmate Sky Kennel does include accessories that are standard required airline essentials. Included are dog identification stickers, “Live Animal” labels, food and water cups to keep your pet nourished and refreshed, and an absorbent pad for handling any crate spillages. However, one small potential snag with the Petmate Sky Kennel is that it uses plastic wing nuts to secure the two halves of the crate. Some airlines like United are okay with metal bolts and plastic wing nuts, so long as the plastic wing nuts are unbreakable. If plastic is unsuitable, you can easily replace these parts yourselves with an inexpensive pet airline travel hardware kit. Some airlines also insist that the crate door remains securely attached to the crate. To do this, you’ll require some hand releasable cable ties. Even if the airline doesn’t require the bolts and cable ties, you may like to purchase them for your own peace of mind that your pet will be safe and secure. You can get the Petmate Airline Travel Kit to ensure you have everything you need. A soft pet carrier is an alternative if you wanted a carrier for travel but find plastic dog carriers too bulky or unwieldy. Or perhaps you would simply find it easier to carry around a sports bag style carrier, with the convenience of having sports bag style carry handles or a shoulder strap. A soft dog carrier serves this need perfectly and is comfortable for your pet. The Sherpa Deluxe Pet Carrier has plenty of useful features to make transportation, comfort and security of your pet easy. It is an airline approved pet carrier and is great for in cabin air travel with your pet, if you are planning on traveling with your pet by air. Similar to plastic crates, these types of crates are commonly used for travel. They also serve a function as a kind of dog home as well, being that they are more comfortable because they are soft. When it comes to travel by air however, again regardless of it being marketed as airline approved, you will also want to check with the airline carrier that you are considering flying with, who may have their own additional requirements. And also because they offer more privacy for your dog via mesh windows and rollup doors. To maintain their shape, these crates are usually reinforced by an internal steel frame. The Petnation Port-A-Crate E2 Indoor/Outdoor Pet Home is our pick if you are looking for a simple soft sided crate that you can use both indoors and outdoors. These are distinct from outdoor dog kennels in that these ones are typically purchased for indoor use both as a den for your dog as well as an attractive piece of furniture or table. Their main attraction is that they typically function as a table or at least look like a piece of furniture. So you get a sturdy and secure cage combined with a decorative design. These designs typically come in one of two styles. Either way, they are designed to have a wooden end, hence the end table name. And in turn this makes them stand out as an attractive table or centerpiece item of furniture, instead of a simple cage. And of course being that the top of these kennels functions as a table, that means you get to place books, ornaments or any other item that you like on top. The Casual Home Pet Crate End Table is a beautiful piece of wooden furniture that will look great as a centerpiece in your living room or wherever you wish to have the crate, while working as a den for your pet. It is available in a choice of black, espresso, or white. A popular alternative and example of the hybrid design is the Merry Products Pet Crate. As the name suggests, this type of dog kennel cage is focused mainly on the pleasant aesthetics of the cage/kennel than utility. As such you will only want to get one of these if your pet has already been trained. If they haven’t, then you risk them destroying it. Going beyond wooden end table crates (above), decorative kennels offer a range of styles, materials and finishes. DenHaus makes a number of fancy dog kennel designs to tickle the fancy of someone looking for a nice way to combine a private kennel for your dog with a beautiful furniture centerpiece. Some designs also combine a kennel with a ladder and an upper platform for your pet to rest on and choose when he wishes to rest in private and when he wishes to sleep. Heavy duty dog crates are a must if you have a dog that is aggressive, difficult to control, or tends to panic easily and makes short work destroying other types of crate. Or similarly if you have a Houdini dog that escapes from their crate, always managing to find and exploit weaknesses its design weaknesses. These are designed to keep your large dog secure, with a sturdy and robust build intended especially to withstand the force of an escape artist dog that is determined to break out. They come in Medium, Large, and XL sizes to accommodate most breeds, although it can be difficult sometimes to get a crate for the largest breeds. They are typically made from tough metals like steel or aluminum. They feature a more sturdy and robust design over their wire counterparts. Thus they fill the need of being a virtually indestructible escape proof Alcatraz for strong or smart Houdini escape artist dogs. There are cheap versions of these crates available too. You will want to be very cautious and selective if you are wanting to go for one of those. Some of these crates are low quality. And while they may look stronger than a regular crate, your pet may have little difficulty destroying it. They may even be unsafe. If you are looking for the best balance of robustness and price, and only require it for home use, then the ProSelect Empire Crate is our choice of the best metal dog crate for large dogs, for owners looking for the best crate for home use only on a price/security ratio. With it’s excellent reviews, it has proven itself to be the robust and sought after solution many owners of smart or powerful canines were looking for. If maximum security is most important for you, or if you have pet travel needs, and if you are happy to pay a bit more for a strong and stable cage, then the high end Impact Dog Crate Stationary or Grain Valley Collapsible Dog Crate are our picks, having an aluminum metal build that is both robust and secure. On top of a stronger and more secure build over the ProSelect, it also comes with two additional benefits. These crates are portable and quite lightweight compared to the ProSelect, weighing in at just 43 lbs for the large size. So if you envisage needing to move the cage around from time to time – maybe even just to give your pet some fresh air outdoors, you have the flexibility of portability. If you need to travel with your pet, the portability helps with that purpose too. These aluminum dog crates were not just designed for portability, but also for safe air travel too. Both are IATA airline compliant. The Impact Stationary crate is IATA CR 82 compliant. IATA crate requirements are a rigorous standard shared between multiple airlines for International airline pet travel established by the International Air Transport Association (IATA). IATA CR 82 goes further. Crates meeting this standard have a construction that is airline compliant and also suitable for traveling by air with pets often considered to be (justified or not), of an aggressive / dangerous nature, i.e. pitbulls and mastiffs. However, do also check the airline’s pet travel requirements regardless. This is because while IATA pet crate requirements do provide a common set of standards across international airlines, those airlines are still free to (and do) set their own additional requirements. You will also need to ensure that the crate meets correct label and marking requirements and ample food and water is correctly provided for. With all its versatility, features and tough aluminum build, it is no surprise that he Impact dog crate has received great dog crate reviews. For dog owners looking for a robust solution, this is one of the best options. One important aspect when it come to purchasing the best dog kennel for your pet is that you select a crate that is neither too small, nor too large. So you will want to ensure that you have measured your dog correctly before you buy a crate. You will need to measure your dog while he or she is standing naturally on all fours, the crates will need to be able to accommodate them while standing, as well as allowing your dog to be able to lie down and stretch to his full body length. So you will also want to measure your dog while he is in his preferred sleeping style. 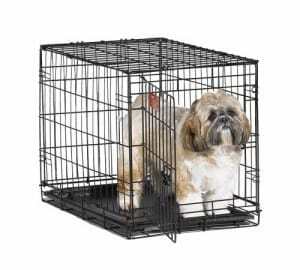 In short, your dog should be able to comfortably stand, rest, and turn around inside the crate. It should be no larger than that, otherwise you may find that your pet decides to use one section of the crate as the toilet. Crates can come in various sizes. Here's a rough guide to example crate sizes and suggested dog weight and example breeds. Be sure to check to check the manufacturer or retailer's details of the crate you are considering purchasing, to confirm the cage dimensions, and their recommended weight and/or breeds that their crate is suitable for. If the cage is not large enough for your dog to be able to relieve him or herself in, then he or she will usually refrain from relieving theirself while they are still inside the crate, making housebreaking easier. The exception to the rule is for puppies, as they are still growing. Ensure that you get maximum value for money and look for a crate that comes with a divider panel. 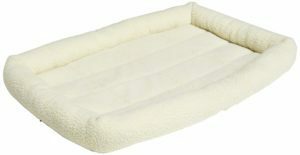 is large enough to accommodate your puppy as he grows. A divider panel enables you to section off an area of the crate. This allows you to limit the accessible area of the crate to the precise amount of space that your puppy needs at his or her current size. You can move the divider further along the free space as your puppy grows. For small breeds of dogs that way up to 25lbs, a crates measuring 24”L x 18”W x 21”H will be adequate. The medium-sized dog up to 40lbs, you need a crates that measures 30”L x 21”w x 24”H. For a large dog weighing up to 70lbs, you will need a crate that measures 36Lx24”Wx27”H. For extra large dogs up to 90lbs, 42”L x 28”W x 31”H. And for the dogs larger than that the maximum crate size, you’ll be looking at a crate of 46”L x 30”W x 33”H or above. Buying the best dog crate for your pet is also a matter of identify that correct type of crate you require. Some critical things to consider are the size and temperament of your dog. The kennel needs to be the right size – not too big and not too small to comfortably contain your pet. It also needs to be strong enough. Some crates simply serve as a basic or decorative container for your pet. As such decorative kennels may fail to satisfy the latter aspect if you are the owner of a strong and determined escape artist pets. Most decorative crates may only be adequate for a housebroken pet that will not try to escape from it. Or a puppy undergoing training that isn’t strong enough to break out of it. Other crates are very strong and sturdy to contain dogs that will do their best to break or escape from the cage. So one of the first essentials to consider before buying a crate is the size and weight of your dog, and whether your dog is likely to remain passive, or get aggressive or panic when placed inside a crate. Assuming you have a puppy, or a tame dog that will not try to break out of his cage, there are several types of crates that you may buy. You can buy crates are made of wood, wicker, plastic, metal wire, soft sided material, or metal including aluminum. Let’s look at each of these different types, so you can find the best cage for you in the correct category. For powerful escape artist dogs or those that get aggressive or panic when placed in a cage, then you need to consider heavy duty dog crates. Pet crates usually come with a single door, double door, or triple door design. The only reason why you will want to have a crate with more than one door is if you want to have greater convenience in accessing your pet and the areas inside the crate. Or if you want your pet to have this extra convenience. If you do not need more than one door, then there is no need to buy a crate with more than one door. Pet crates typically come with a plastic floor. Some of them have a removable plastic pan floor. The pan is usually very easy to clean for maintenance or after accidents or soiling. It is great just to use the plastic tray as the floor while potty training your pet. However if the crate is also going to be used as a bed or personal kennel for your dog, rather than just for training purposes, then you may wish to purchase a dog bed for your pet’s crate to make your pet feel more comfortable inside the crate. Of course, your pet should also have already been potty trained, otherwise that bed will quickly get soiled, start to stink, and will not last very long. Similarly, you will want to consider how you’ll be providing food and water to your pet if you’ll also be introducing a bed to the crate. You will probably at least want a sturdy, secure and non-spill water dispenser and/or bowls that you hang inside the cage to limit spillage. Loose food and water bowls on the floor can easily be spilled, especially for untrained dogs. You don’t have to look too far to discover a great place where to buy a crate. Amazon have a fantastic selection. All the dog kennel cages featured on this page are at the time of writing available to buy on Amazon. So scroll back up to choose the type of cage you require and click through to Amazon. If you do not like any of the designs we’ve highlighted, there are many more for you to investigate and select for yourself. You might also wish to consider a dog crate cover to help settle your dog at night, or whenever you wish or her to rest. Thanks to its folding and collapsible design, metal wire cages like Midwest wire cages mentioned above are just as quick and easy to take down as they are to set up. This is great if you want to conserve space when the crate is not in use, or if you need to stay in a hotel or other environment that requires your pet to be crated. So you’ve got your crate and of course it looks a bit bare, and if you’re going to leave your dog alone for a few hours, you might want her not to feel hungry, thirsty, or bored. And you might not want her to feel uncomfortable. So let’s look at a few things to add to your pet’s crate to keep her happy. Good dog toys to keep them busy as well as treats can help prevent your dog becoming bored, as well as helping her overcome separation anxiety if she also gets distressed when she sees you leaving her. The idea is to get your dog to learn that their crate is a pleasant and safe place to be. And that it is their private space or retreat. Your dog must not feel that a crate is a place for punishment and abandonment. Providing your pet with things that form a pleasant association with the crate can help a lot with this aim. The Kong Dog Toy is one of the best dog toys available that can help play a role in crate training and helping your pet overcome separation anxiety. It functions as a dog chew toy, as well as a food and treat dispenser. Your dog is going to have to spend a bit of time to get the contents out of the toy. The idea is that they quickly become occupied with the toy and consuming the treats, instead of pining for you. It comes in three different versions according to the age of your pet. There’s a fourth version for a power or extreme chewer. 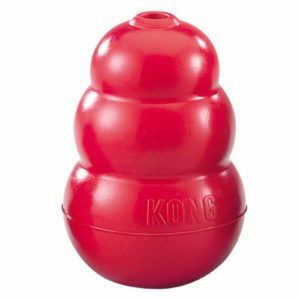 There are different Kong dog toy sizes of each version to suit the breed and build of your pet. 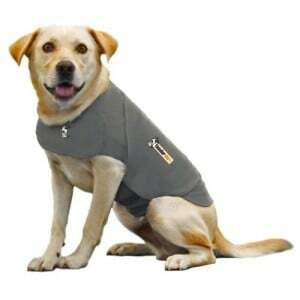 If you have a dog that has acute anxiety issues, you could check out the Thundershirt for dog anxiety. It’s available to buy on Amazon. It is not something to simply put on your dog and hope that it solves the problem though. It’s more like a tool that you may like to use to help with active crate training. Using the Thundershirt for brief periods while actively training your pet to get used to using the crate. This is because it’s mainly a situational device designed to help your pet get through temporary situations that cause them a high degree of anxiety. For example times of loud and disruptive noises like thunderstorms. Or for taking your pet away with you for travel, if that’s something that they’re not used to and/or not comfortable with. It works by applying a gentle pressure to the dog like they are being hugged. Hence it provides a sensation of being comforted during stressful situations. So it may help while actively crate training with your pet. But perhaps not so much for leaving your pet alone and returning later in the day. Some dogs respond better to having their olfactory senses stimulated, rather than the physical stimulation provided by the Thundershirt. As such the makers of Thundershirt have also produced the Thunderspray. 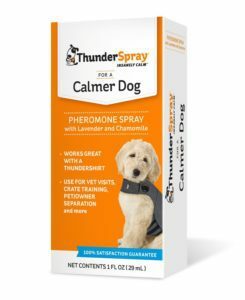 The Thunderspray contains natural pheromones and combines with them with the soothing scents of camomile and lavender to stimulate a calming and comforting effect on your dog. So now you are armed with all the above info on the different types of crates. You’re now able to choose the correct kennel for you. Our selection of crates are backed with excellent reviews from its buyers. So you are also able to shop with confidence for the best crate of each category for your pet. You also learned to take into account whether your pet is a puppy or adult, their size, and their temperament. Each of these essential considerations to help with choosing a kennel. And also to consider whether the crate is solely for training and home use, or also for travel. Now you know all of the essentials to choosing a dog cage. We trust that you now feel confident to buy the best rated dog kennel for you and your pet.